I have never been able to fill in my eyebrows I often end up looking like I have added black felt tip to my eyebrows so until they are done professionally I think I will stick to a simple routine. I am quite lucky that I have quite full eyebrows and I'll let you into a secret I have never plucked my eyebrows, maybe a few stray hairs but have never been shaped. I know your thinking that I have monster eyebrows but In fact there not bad, the big bold eyebrows is a trend that I love so not touching my eyebrows creates that affect. Not everyone will see this as an option but using simple tools can be an easy way to creating the perfect brow for me the two staples are Vaseline and a spoolie. 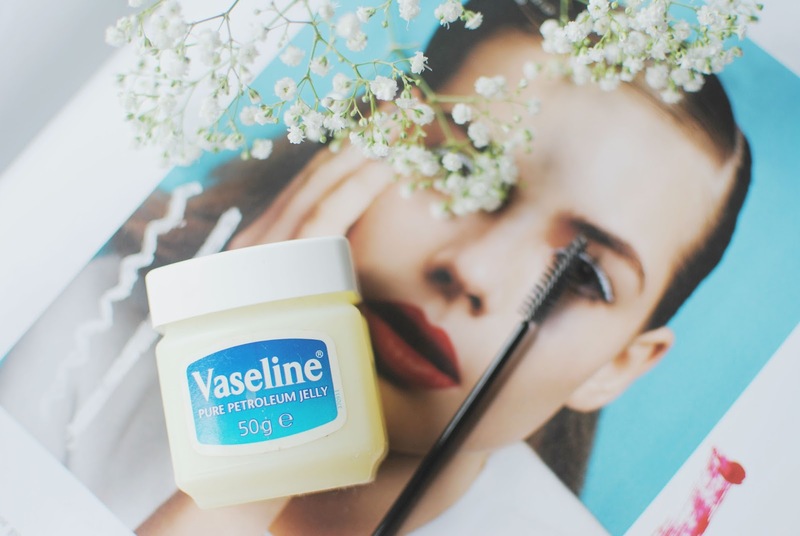 I scoop some of the vaseline onto my hands and then using my spoolie I apply a thin layer and gently apply it to the brows ensuring I have not left behind any clumps. This quick and easy method may not be everyones cup of tea but for me it's perfect plus it's super cheap and hassle free. Have you got any quick and easy make up alternatives ? This is a great tip! I always struggle with filling my eyebrows because mine are naturally pretty bold so if I fill them they always look too thick, then something like this would be great. I have never thought of doing this on my brows. My friend has fair hair so se doesn't fill in her brows this would be a great alternative.